For its 50th anniversary season Young People’s Theatre commissioned a play for its youngest-ever audience – infants from three to twelve months, but suitable for children up to 24 months. It sounds incredible but the wordless theatre piece that the collective of Maja Ardal, Audrey Dwyer, Mary Francis Moore & Julia Tribe has devised holds its tiny audience and their adult companions completely entranced for its 23-minute duration. If you want to give your child an experience of non-digital entertainment geared specifically to its interests, this is a show not to miss. The YPT Studio Theatre has a carpeted area strewn with all manner of pillows for the audience of parents and their children meant for a maximum of 60 persons. YPT has also provided a stroller parking area and a baby changing area nearby. The carpeted area lit with a wide variety of shaded lamps looks towards Julia Tribe’s all-black stage with three short all-black walls. The three performers – Maja Ardal, Audrey Dwyer and Julia Tribe – are also clad mostly in black. Initially, the emptiness of the stage makes one wonder how the performers will make the stage as interesting as the warm, colourful place where the audience is sitting. There’s no need to worry, the black stage stage holds many secrets. The 23 minutes are divided into a series of sequences all based on the concept of surprise. The first action the performers take is to hide behind each of the three walls and pop up their heads peekaboo style in different sequences. Readers of elementary child psychology will know that there is a reason why peekaboo is a game that has universal appeal. For children younger than six to eight months, the disappearance and reappearance of a face is startling. But children six to eight months and older have learned the fundamental cognitive concept called “object permanence” which means that they have realized that just because they can’t see an object doesn’t mean it’s not there. When a human face disappears, children anticipate that it will reappear and are overjoyed that what they have just discovered about the world is true. That’s why it’s hard to stop playing peekaboo because children enjoy having their new insight confirmed over and over. After the performers establish this game, they modify it by having a different performer’s head pop up where one performer’s head has gone out of sight. The children have to look from wall to wall to link the one disappearance with the right reappearance. In this manner the entire show proceeds – first establishing a concept, then modifying it, then combining it with another concept. Director Mary Francis Moore has directed the piece so that each new element of the show lasts long enough so that the children learn what the rules of the game are before moving on to changing or modifying the game. 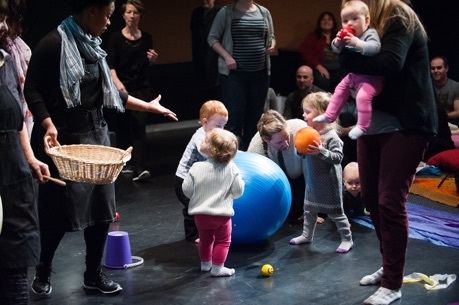 This procedure goes a long way toward explaining why the show holds such young children in such rapt attention – infants want nothing more than to learn about the world and the sensitively constructed show taps directly into that desire by presenting new understandable phenomena one after another. The second activity after peekaboo is a variation on appearance and disappearance – bubbles – only this time the disappearance is permanent until the performer blows more. First one performer blows the bubbles, just ordinary soap bubbles, and the other two try to pop them before they burst on their own and then try to bite them, which is funny in itself. The bubble-blowing provides a link to three more themes of the show – balls, hoops and water. The reason behind the all-black set becomes apparent when suddenly the performers pull a length of blue fabric from a hiding place across the entire stage. This surprising new element is combined with the old element of peekaboo, this time with the performers making faces each time they reappear. The next object to appear and disappear is a ball. The same ball pops up and falls down enough times to establish the pattern until a new ball appears that is bigger and in a different colour. It looks like magic, as if the same ball were growing larger and changing its colour itself. Then the blue fabric comes down and we see all the different balls all together that the performers take up to throw to each other. Another blue banner like the sky is pulled across the back of the stage. The next stage is to throw the balls through hoops, thus creating a parallel to the bubble-blowing earlier. This is then linked to peekaboo by the ball-throwing performers putting their heads through the hoops to meet. The blue fabric on the floor looks like a stream and the performers begin to treat it as such. One takes an empty jug, “fills” it from the “stream” and waters the fronts of the walls. Gradually, giant sunflower heads appear, mimicking peekaboo but, unlike the performers’ heads, remaining above the walls. A surprise transformation is in store when the pretend water the performer has been pouring changes at some point into real water that fills a basin. The climax of the show is when another ultralight fabric appears from behind one of the walls and two performers make it float like a rolling wave over the whole audience and back several times. This is a delight for both the children and adults because it is the first time the audience/stage divide has been breached and because the effect is so enormous and so beautiful. This and a final effect I will leave as a surprise link the stage to the audience and naturally lead to the second phase of the show where the audience is invited onto the stage area for another 25 minutes to play with the various objects they have seen throughout the action. This physical and tactile connection adds to the visual and aural sensations that marked the performance proper and completes the smaller audience members’ understanding of what they have witnessed. The concept, theme and two years of research for the show was done by Maja Ardal, who was once the YPT Artistic Director. What she discovered and what she and the other three women demonstrate so conclusively is that it is possible to create a theatre experience for infants if you appeal to the skills that they are in the midst of developing in order to understand the world. Pleasure in having their guesses about how the world works confirmed are combined with variations that the older children at least will be intrigued to work out. Other than one baby who needed to be fed and then changed, all the rest sat in total silence, eyes glued to the stage. One little fellow right in front of me waved a pacifier away that his mom tried to give him because he was concentrating so hard. This level of concentration stems both from the surprise of visual and aural stimulation and from the mental stimulation this engenders as the children come to understand the actions they see. The ancients said that to delight and to educate were the twin goals of theatre, and it is clear that this is true even for these youngest of all theatregoers. The performers provide aural stimulation through humming a do-re-mi sequence, making sound effects and through drumming and finger-cymbal ringing. Some of the audience are also provided with rattles to play along. My one observation for improvement would be to encourage more use of music since this pleased the older audience members so much and helped to heighten the attention of the very youngest audience members. So toddle if you can, or crawl, to see this show while you can. Or better yet, have your adult parent or guardian take you to see it. There’s no way to know what effect only one show will have, but such a group experience for children of this age is so unique and so fascinating that adults themselves will likely learn new things about their own children and about children in general. The show was a real eye-opener for me and I felt privileged to feel the joy of so many young minds so completely engaged by the essence of theatre. 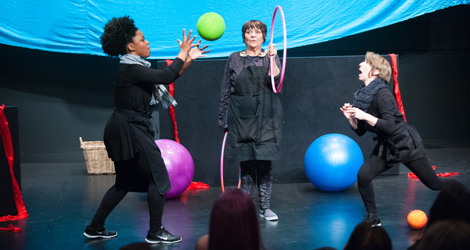 Photos: (from top) Audrey Dwyer, Maja Ardal and Julia Tribe; Audrey Dwyer, Julia Tribe and audience members during playtime after the performance. ©2016 Avital Zerner.